(NEW YORK) — The Satanic Temple — yes, that’s a thing — has made good on its earlier threat to sue Netflix and Warner Brothers, Variety reports. At issue is the new Netflix series The Chilling Adventures of Sabrina, which the Temple claims has ripped off their statue of the goat-headed deity, Baphomet. The lawsuit, filed Thursday in U.S. District Court in New York, claims that a statue of Baphomet that can be seen in the show looks exactly like the Temple’s statue, which was unveiled in Detroit in 2015 and has been publicly displayed in various cities. 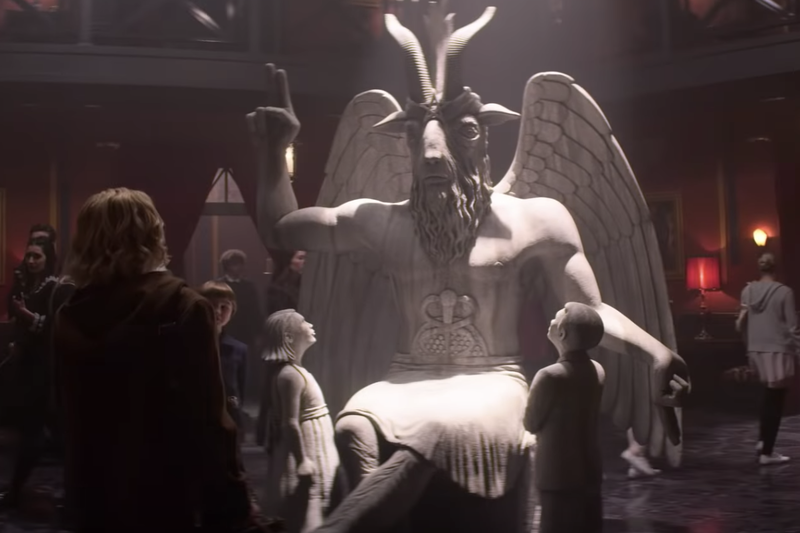 In The Chilling Adventures of Sabrina, a statue featuring a goat-headed man, flanked by two children looking up at him, can be see in the rotunda of the Academy of the Unseen Arts, the school attended by the half-mortal, half-witch Sabrina. The Temple’s statue also features a goat-headed man flanked by two children gazing up at him. The Temple admits that its statue, created between 2013 and 2014, is based on iconography that dates back to the 19th century, but also claims it contains elements that make it an “original expression” and therefore subject to copyright. According to the suit, the Temple maintains its copyrighted statue has been “hijacked in service of a stereotypically evil representation.” Apparently, to the Temple, Baphomet isn’t inherently evil. In the TV show, however, the school is presented as an evil place, where all students are expected to pledge themselves to Satan, the Dark Lord. Warner Bros. and Netflix have declined to comment, According to Variety.